What can I say? I have yet to read a Linda Lael Miller story I don’t like. 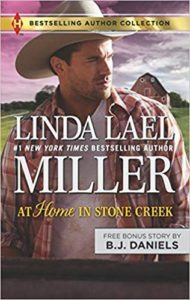 Chock full of Ms. M’s trade-mark heart-wrenching emotion, strong family attachments, sentiment, and in this story, a twist of dangerous intrigue, At Home in Stone Creek took me to my happy place.